▼ Three models for the maximum wire rope diameter 26, 36, and 44mm. ▼ Easy operation : AFter tensioning the wire rope and the current is applied, red annealing occurs. By slowly turning the hand wheel, a special designed device will twist and pull apart the wire rope at the same time to make sure the ends are twisted and tapered. 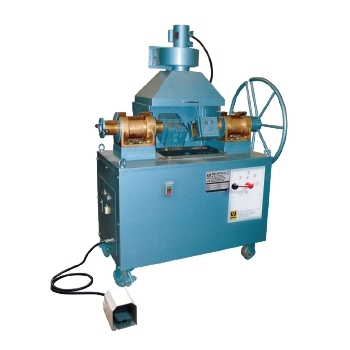 ▼ Allows annealing and tapering different sizes of wire rope by adjusting the distance between the machine chucks. ▼ Unique design for grips to secure the wire rope properly. ▼ Optional Accessories : Suction device.